On 9/11, was Building 7 destroyed in a controlled explosion? There have been a lot of claims made about the circumstances surrounding the events of 9/11 and Building 7 in particular. The central claim regarding Building 7, that I have heard personally, is that Building 7 fell in such a perfect fluid motion that its collapse had to be due to a controlled demolition. Furthermore since Building 7 wasn't hit by a plane directly, it is claimed that there can be no other explanation for how the building collapsed in such a seemingly controlled fashion. Is there any evidence to support the claims that Building 7 was destroyed in a directly controlled fashion? Fires ignited by falling debris (from WTC 1) are the sole cause of the WTC 7 collapse. Debris from the collapse of WTC 1, about 350 ft. to the south, impacted WTC 7, igniting fires on at least 10 floors. Other than starting the fires, the debris impacts were not a contributing factor. Fires on six of those floors grew from the time of the debris impact (10:28:22 a.m.) and lasted until the building collapsed (5:20:52 p.m.). After several hours, the heat absorption ability of the fire-proofing began to fail. The building's structural steel began to soak up heat from the fires. A ''seated connection'' was used for some of the girders framed to interior columns. The girder was held by four "erection bolts" (''girders'' span between columns; ''beams'' span between girders). A 13.7 m (540 in.) long W33x130 beam heated uniformly to 600 °C will expand along its length by 4.5 inches. In doing so it will produce a lateral force of 6.9 million pounds (30.7 million newtons). The four erection bolts resisting this force had a total shear capacity of 0.180 million pounds (i.e., 2.6 percent of the possible force). By the time the girders reached 164 °C the four bolts had failed (i.e., torn in two, ripped apart, cleaved in twain, etc.). With the failure of the bolted connection, further thermal expansion of the floor beams pushed a 13th floor girder, between Columns 79 and 44, off its seat. The flooring system on Floor 13 subsequently failed, collapsing onto the floors below, resulting in the collapse of floors 12 through 6. The floor collapse left more than 150 ft. of Column 79 without lateral support. Without structure transferring load laterally, Column 79 buckled and failed. The transfer of load, once supported by Column 79, overwhelmed the structural capacity of the other columns. They too failed. After burning for 6 hours and 52 minutes, WTC 7 suffered a fire-induced progressive collapse. The building was completely destroyed. In a seated connection, the beam or girder was supported by the seat, which was welded to the column. Bolts were installed that fasten the beam or girder to the seat for erection purposes These erection bolts did not carry any gravity load; rather, they were installed to insure that the beam or girder was held in place during erection. 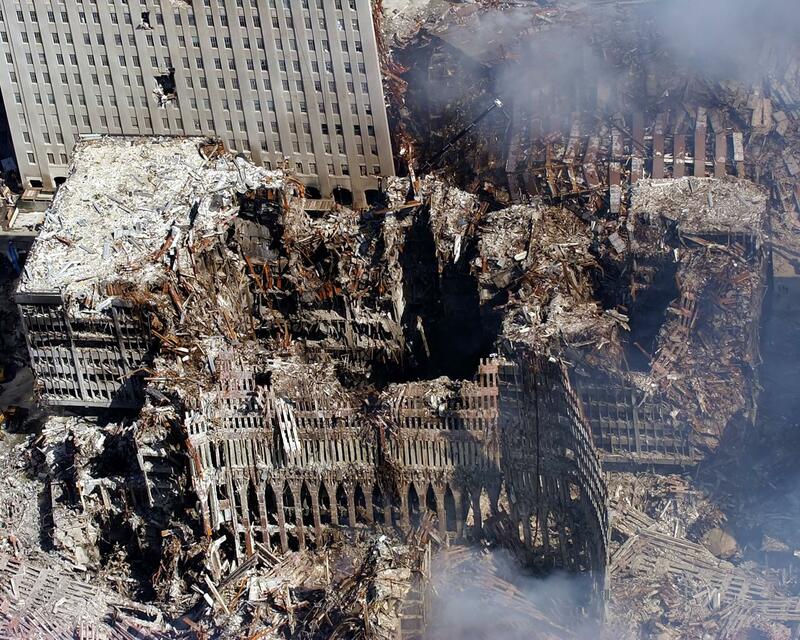 NIST found no evidence that the girders or beams in WTC 7 were welded to the seats. In a similar way. an angle or plate was bolted to the top flange to prevent the beam or girder from twisting, but there was little restraint to bending in the plane of the beam. Consider the girder that spanned between Column 79 on the interior of the building and Column 44 on the exterior. Thermal expansion of this girder would have loaded the erection bolts in shear, since (1) there were no shear studs anchoring the girder to the slab (and thereby restraining elongation), and (2) the columns were prevented from lateral movement because they were embedded in the floor slabs which had considerable in-plane stiffness. Additionally, the expansion of floor beams that framed into this girder, because the framing was asymmetrical, tended to add additional shear load to the erection bolts. The combination of these two shear loads could have failed the bolts in shear. If the erection bolts were to fail, then there would be no positive attachment preventing the girder from being pushed off the seat. Source: (NCSTAR 1-9) VOLUMES 1 and 2, page 348. The first failures observed were of the shear studs, which were produced by axial expansion of the floor beams, and which began to occur at fairly low beam temperature of 103 °C. 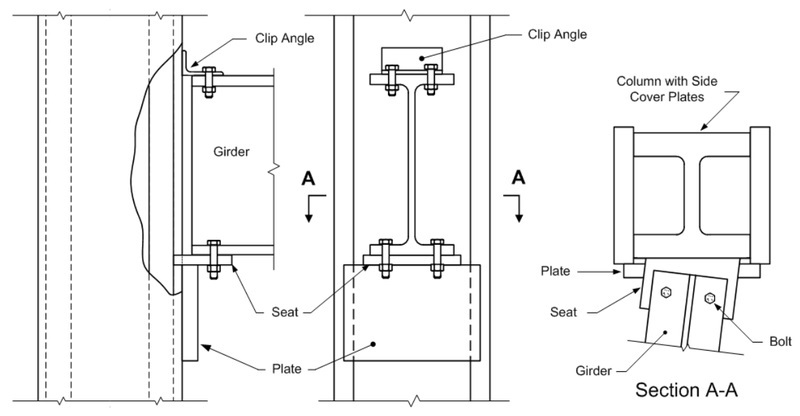 Axial expansion of the girder then led to shear failure of the bolts at the connection to Column 79; and, at a girder temperature of 164 °C, all four erection bolts had failed, leaving that end of the girder essentially unrestrained against rotation. Continued axial expansion of the floor beams pushed the girder laterally at Column 79, as shown in Figure 8-26, in which failed shear studs and bolts were evident. When the beam temperatures had reached 300 °C, all but three shear studs in the model had failed due to axial expansion of the beams, leaving the top flanges of the beams essentially unrestrained laterally. Continued axial expansion of the girder caused it to bear against the face of Column 79, generating large axial forces that led to failure of the bolts connecting the girder to Column 44. When the girder temperature had reached 398 °C, all four erection bolts at Column 44 had failed, leaving the girder essentially unrestrained against rotation at both ends. After failure of the erection bolts in the seat at Column 44, continued axial expansion of the floor beams pushed the girder laterally, where it came to bear against the inside of the column flange. Axial compression then increased in the floor beams, and at a beam temperature of 436 °C, the northmost beam began to buckle laterally. 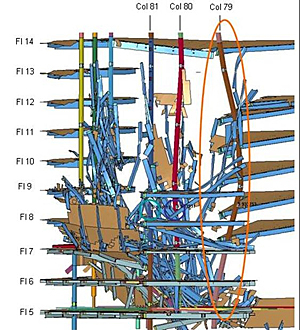 Buckling of other floor beams followed as shown in Figure 8-27(a), leading to collapse of the floor system, and rocking of the girder off its seat at Column 79 as shown in Figure 8-27(b). The collapse process took time to occur in the LS-DYNA analysis, during which the temperatures had ramped up to their maximum values in the simulation. Source: (NCSTAR 1-9) VOLUMES 1 and 2, page 352. The simple shear connection between Column 79 and the girder that spanned the distance to the north face (to Column 44) failed on Floor 13. The connection failed due to shearing of erection bolts, caused by lateral thermal expansion of floor beams supporting the northeast floor system and, to a lesser extent, by the thermal expansion of the girder connecting Columns 79 and 44. Further thermal expansion of the floor beams pushed the girder off its seat, which led to the failure of the floor system surrounding Column 79 on Floor 13. The collapse of Floor 13 onto the floors below-some of which were already weakened by fires-triggered a cascade of floor failures in the northeast region. This, in turn, led to loss of lateral support to Column 79 in the east-west direction over nine stories (between Floors 5 and 14). The increase in unsupported length led to the buckling failure of Column 79, which was the collapse initiation event. Source: (NCSTAR 1-9) VOLUMES 1 and 2, page 611. To further clarify the descent of the north face, NIST recorded the downward displacement of a point near the center of the roofline from first movement until the north face was no longer visible in the video. 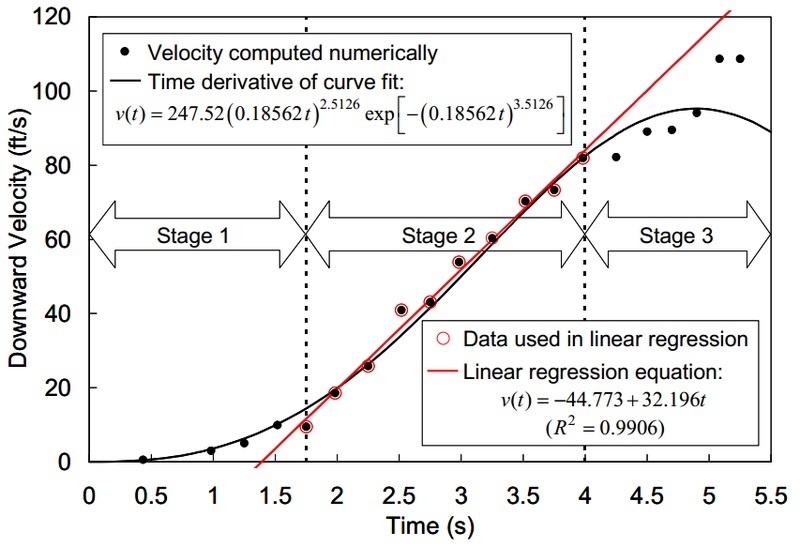 Numerical analyses were conducted to calculate the velocity and acceleration of the roofline point from the time-dependent displacement data. The instant at which vertical motion of the roofline first occurred was determined by tracking the numerical value of the brightness of a pixel (a single element in the video image) at the roofline. This pixel became brighter as the roofline began to descend because the color of the pixel started to change from that of the building façade to the lighter color of the sky. The approach taken by NIST is summarized in NIST NCSTAR Report 1A, Section 3.6, and detailed in NIST NCSTAR Report 1-9, Section 12.5.3. Stage 1 (0 to 1.75 seconds): acceleration less than that of gravity (i.e., slower than free fall). Stage 2 (1.75 to 4.0 seconds): gravitational acceleration (free fall). Stage 3 (4.0 to 5.4 seconds): decreased acceleration, again less than that of gravity. :This analysis showed that the 40 percent longer descent time—compared to the 3.9 second free fall time—was due primarily to Stage 1, which corresponded to the buckling of the exterior columns in the lower stories of the north face. During Stage 2, the north face descended essentially in free fall, indicating negligible support from the structure below. This is consistent with the structural analysis model, which showed the exterior columns buckling and losing their capacity to support the loads from the structure above. In Stage 3, the acceleration decreased as the upper portion of the north face encountered increased resistance from the collapsed structure and the debris pile below. Source: Questions and Answers about the NIST WTC 7 Investigation. Many of the claims and assertions by WTC 7 conspiracy theorists can be found at WTC 7 Draft Reports for public comment. The submission by Richard Gage of Architects & Engineers for 9/11 Truth is a good representation of how 911 conspiracy theorists rely on a lack of evidence to somehow draw conclusions (see: argument from ignorance). The National Institute of Standards and Technology (NIST) is responsible for conducting fact-finding investigations of building failures that resulted in substantial loss of life or that posed significant potential of substantial loss of life. How did the fires cause WTC 7 to collapse? The heat from the uncontrolled fires caused steel floor beams and girders to thermally expand, leading to a chain of events that caused a key structural column to fail. The failure of this structural column then initiated a fire-induced progressive collapse of the entire building. How hot did WTC 7's steel columns and floor beams get? Due to the effectiveness of the spray-applied fire-resistive material (SFRM) or fireproofing, the highest steel column temperatures in WTC 7 only reached an estimated 300 degrees C (570 degrees F), and only on the east side of the building did the steel floor beams exceed 600 degrees C (1,100 degrees F). However, fire-induced buckling of floor beams and damage to connections-that caused buckling of a critical column initiating collapse-occurred at temperatures below approximately 400 degrees C where thermal expansion dominates. Above 600 degrees C (1,100 degrees F), there is significant loss of steel strength and stiffness. In the WTC 7 collapse, the loss of steel strength or stiffness was not as important as the thermal expansion of steel structures caused by heat. Some people have said that a failure at one column should not have produced a symmetrical fall like this one. What's your answer to those assertions? Did investigators consider the possibility that an explosion caused or contributed to the collapse of WTC 7? Is it possible that thermite or thermate contributed to the collapse of WTC 7? NIST has looked at the application and use of thermite and has determined that its use to sever columns in WTC 7 on 9/11/01 was unlikely. An emergency responder caught in the building between the 6th and 8th floors says he heard two loud booms. Isn't that evidence that there was an explosion? The sound levels reported by all witnesses do not match the sound level of an explosion that would have been required to cause the collapse of the building. If the two loud booms were due to explosions that were responsible for the collapse of WTC 7, the emergency responder-located somewhere between the 6th and 8th floors in WTC 7-would not have been able to survive the near immediate collapse and provide this witness account. *NIST is an agency of the U.S. Department of Commerce. Not the answer you're looking for? Browse other questions tagged politics 9-11 . Is there anything inexplicable about how the WTC Twin Towers collapsed? Was 9-11 planned by the US Government? Destruction of WTC: is this version somehow substatinated? Did planes crash into the WTC on 9-11? Was the BBC report of the WTC-7 falling before it happened a scripted event? Is there any other skyscraper that was destroyed totally just by fire except the three World Trade Center towers? Does jet fuel have a maximum burning temperature of 980 °C? Was Osama Bin Laden responsible for 9-11? Was WTC insured shortly before the attacks? Was the passport of one of the 9/11 terrorists found, while “nothing else” from the airplane was recovered? Has Angola destroyed all its mosques and banned Islam itself? Was Flight 93 shot down? 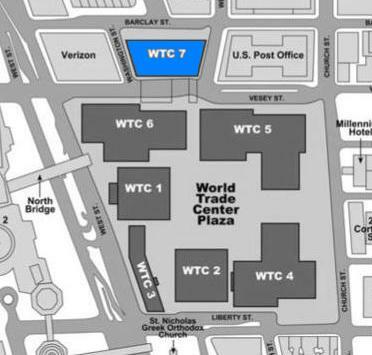 Was a pair of handcuffed hands found near the World Trade Center after 9/11? Did 120,000 Egyptians die building the Suez Canal?